We hope those of you who have just started the term have enjoyed your first week back. The weather continues to be kind to us, although can make for some uncomfortable evenings! Have you or your team been looking for previous editions of the Kōrero. Did you know that all previous editions can be found at www.wmkindergartens.org.nz/archive. Perhaps you could save this link to your desktop for easy reference. You may notice a few issues with scanning, this has to do with changes from Vodafone. If your scanning function isn’t working please either arrange to have timesheets and returns dropped to the office or take a photo and send it in. If you do send a photo, please make sure all the information can be read. Thanks. Over the next few weeks Chanelle is hoping to distribute the proposed logos to kindergartens. She will be visiting kindergartens for 10 mins to drop of the proposed logos and signage and answer any questions you may have. We have had a few changes happen within the Senior Teacher team. Lyn Wright continues her secondment with ERO, and Leanne Nelson, current Head Teacher at Upper Hutt Kindergarten has stepped into this role until the beginning of March. Helen Smithies is still on leave and enjoying her time teaching in Abu Dabi, and Helen Tyrell, current Head Teacher at Waitangirua has stepped into this role for Term 1 of 2018. Andy, Catha, Paula, Fiona, Tania, Jane and Lynette, continue to support Kindergarten teams, with a few changes of Kindergarten allocation. 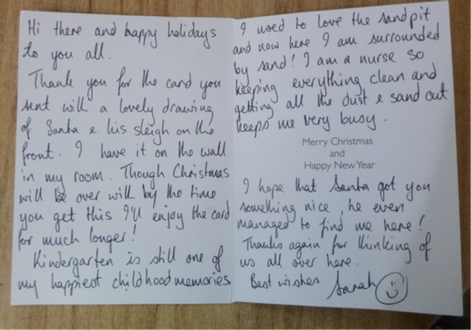 An exciting year ahead! We look forward to working, with and alongside you in 2018! Sharon, the Senior Teaching team and Lupeni. We know that over the break you may not have been thinking about work at all and your login details were probably the last thing you were thinking about. If you’ve forgotten your username you can contact our payroll team and we can remind you what that is (by the way, it’s an email address; either your personal or work address) but we don’t have access to your password. Once you have your username you can connect to iPayroll with that and then reset your password from there. Another useful hint: When you hit ‘reset password’ iPayroll will send you an email with a link to be able to do that. If you don’t recieve that email after a couple of minutes check your email clutter folder as it may have gone there. Contact payroll@wmkindergartens.org.nz if you have trouble. Pelorus Trust have advised that, effective immediately, they are no longer accepting manual grant applications. All grants must be applied for through their online portal. Check out their website here to register. Would you please put Jan as your second contact for all applications made. Also, just a reminder, if you are applying for a grant for your kindergarten would you please email Jan at jan.hannon@wmkindergartens.org.nz to let her know. She needs details of who you have applied to, the amount and what the grant will be used for. When you have heard back from the funding provider would you please also email through a copy of the letter, both successful and unsuccessful. The reason for this is grant funds are paid directly into the Kindergarten Association consolidated bank account. Funding providers do not reference the deposit as to which kindergarten the funds are for therefore it is extremely difficult to reconcile funds if we have not heard from the kindergarten and a risk the funds will not be allocated to your kindergarten. Would you please pass this information on to your committees or your parent help if they are the ones doing the grant applications for you. Just a reminder that the Association has to report “RS7” information about your kindergarten to the Ministry of Education for the current funding period (1 October 2017 – 31 January 2018) by Thursday 8 February 2018. All of the information we require is generated from your enrolment and staff timetable information in Infocare, so we need your help to ensure that all of this is complete and accurate. If your support staff are unavailable to work on Friday can you please ensure arrangements are in place so that this deadline is met – this may mean that these tasks need to be completed by Teaching staff before the cut off. We will be reviewing your Infocare RS7 data so you may receive reminder emails or queries on Tuesday 6 February. No changes to Infocare for the 1 October 2017 – 31 January 2018 funding period will be able to be made after 4pm, Monday 5 February. Your families may be starting to ask about Term 1 requests for Whanau Contributions. Feel free to let them know that these will be emailed out later next week. Hard copies will also be delivered to kindergartens for distribution through “child pockets”. So that we have the most up to date information for our request letters can you please try and have all your children’s enrolment records in Infocare up to date by the end of day onTuesday 30thJanuary 2018. Applications for NZEI Te Riu Roa scholarships to be taken up in 2019 are now open. There are five scholarships of $5000 available - two for early childhood members and three for support staff members. The scholarships are set up to enhance your skills and knowledge within your workplace and in education generally, as well as to advance NZEI’s campaigns through the support staff and early childhood professional and industrial strategies. The government has announced that it will fund the cost of the teacher education refresher (TER) courses for those who have not moved to full registration within six years of completing their qualification. It will fund the TER courses for the first half of 2018, which is expected to support 500 teachers to complete these courses. The initiative is part of a package to improve teacher supply. The Open Polytech and Te Rito Maioha are the providers offering these courses for the early childhood sector. Refresher courses consist of part-time online modules over three months or more, followed by a one month full time practicum. They usually cost between two and three thousand dollars. 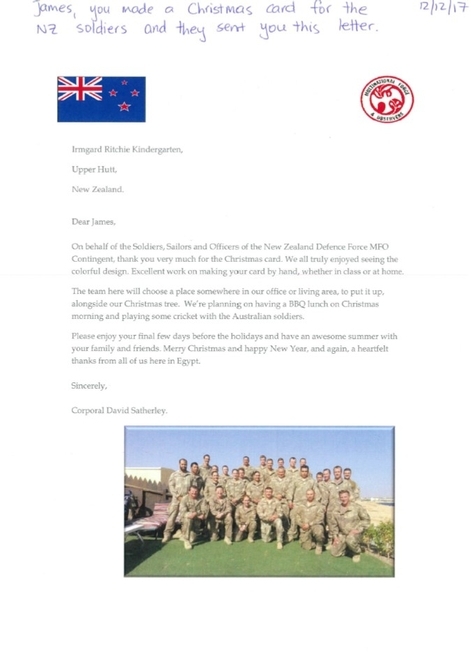 You may remember from Kōrero 152 that the children at Irmgard Ritchie Kindergarten in Upper Hutt made Christmas cards that were sent to New Zealand defence force staff serving overseas. 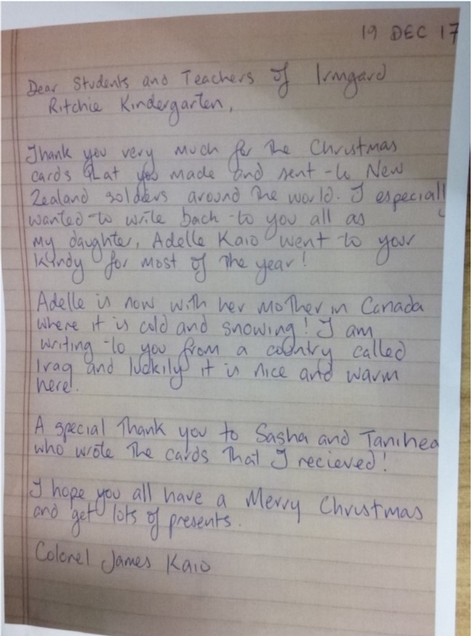 The children were so excited on their return to Kindergarten to see they had received replies to their cards, all the way from Iraq and Egypt. Awatea Kindergarten have had donated a lot of wallpaper books and rolled wallpaper. The Kindergarten would love to share this awesome resource with others. Please give them a call on 04 237 7290 and we can arrange pick up.